Blurring the line between everyday and special occasion cooking, Nadine Levy Redzepi elevates simple comfort food flavors to elegant new heights in Downtime. When you’re married to Noma’s Rene Redzepi you never know who might drop by for dinner…So Nadine Redzepi has developed a stripped-down repertoire of starters, mains, and desserts that can always accommodate a few more at the table, presenting them in a stylish yet relaxed way that makes guests feel like family--and makes family feel special every single day. Gone are the days when the cook is expected to labor alone in the kitchen while family or guests wait for their meal. In the Redzepi home everyone gravitates toward the kitchen to socialize, help, or graze on tasty bites while dinner is prepared, and Nadine wouldn’t have it any other way. Her culinary mantra – pair the very best ingredients with restaurant-inflected techniques that make the most of out their inherent flavors -- puts deliciousness at home well within reach for cooks of all levels. In Nadine’s confident hands, weeknight mainstays like tomato bruschetta, pan-seared pork chops, slow-roasted salmon, or dark, fudgy brownies feel new again. Each recipe is studded with tips to help cooks build confidence and expertise as they cook, as well as restaurant-ready techniques that contribute precision, flavor, and plate appeal to even down-to-earth preparations. With a newfound mastery of essential building blocks like homemade mayonnaise and beurre blanc, a flavorful tomato sauce, or a genius do-it-all cake batter that can be reinvented in a myriad of ways, creating showstoppers like White Asparagus with Truffle Sauce; Rotini with Spicy Chicken Liver Sauce; or a decadent Giant Macaron Cake – just as Nadine does on a daily basis--soon becomes second nature. 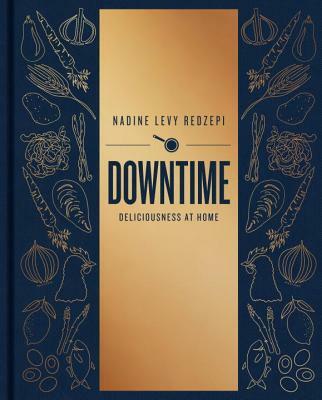 Downtime is a celebration of the joys of cooking well –and making it look easy while you do it, an aspirational guide for any cook ready to take their home cooking to the next level without sacrificing ease or enjoyment in the process. Nadine Levy Redzepi is an enthusiastic home cook, a mother of three, and has spent most of her adult life working with her husband, René Redzepi, at the restaurant Noma in Copenhagen. “Now people can see that maybe the best cook in the Redzepi household isn't René but Nadine! She cooks beautiful nourishing food that is simply delicious. This book is packed with the tips and secrets that make Nadine's cooking so special." "This book is full of ideas, enthusiasm, flavour - and heart." "A wonderful collection of everyday home-cooked meals." "Obviously the Redzepi family takes their food seriously, but Nadine is in charge at home, and keeping it delicious and simple is her metier. Her collection of recipes makes home cooking thoughtful, tasty, wholesome, and satisfying. Most of all, they are accessible and easy enough to make on a weeknight when you want to get dinner on the table and still have time to chill. Nearly all of the recipes in this book are simple enough for a Wednesday dinner, but are also erudite enough to make it look like I may have spent a whole Sunday putting them together. From potato chips to Portuguese pork chops, from gyoza to Jerusalem artichokes, the message is CONGRATULATIONS—you can make this at home! This book will soon have the tattered and dripped-on pages from many uses that are the true badges of courage in my home kitchen library." "This is great family cooking: inviting, achievable and simply delicious." "Nadine's first cookbook is both beautiful and smart; full of recipes to delight and helpful words on cooking better at home. It inspires me to cook, and I promise it will inspire you as well!" "This book is more than a collection of delicious recipes, beautiful images and smart ideas. Nadine's warmth and generosity are a reminder of what is important about cooking, how it binds us together with the people we love."